The title above is the name of a book. My son Brandon recommended it to me. 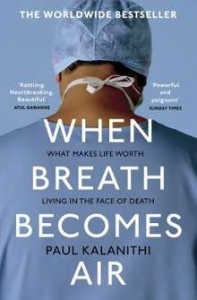 It was written by Paul Kalanithi and published posthumously in 2016 by Random House. Kalanithi was a resident of neurosurgery at Stanford Medical School when he found out he had 4th stage metastatic lung cancer. Shakespearean tragedy told to your aching heart, to your conscience. On purpose I am giving away very few details about the book. I hope I’ve piqued your interest. Read it and it might add something to your understanding of living and dying. It did me. This entry was posted in 散文.